Our heroes must raid a labyrinthine of a long dead wizard to help a temple of pacifist monks! 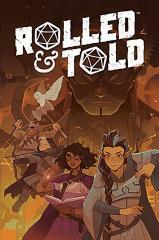 We're solving puzzles aplenty in this issue of Rolled & Told! Try not to get befuddled by these mystifying modules before reading up on imaginative night time encounters, solo role playing, and much more!